The moniker ‘rhino security’ immediately indicates that there is an imminent, serious threat. We have all seen the gory reports. The international news media regularly carries stories on the perilous state of the rhinoceros around the world. In Asia, less than 50 Javan, 250 Sumatran and about 3 000 Indian rhinos survive in the wild. In Africa, there are around 5 000 black rhinos and 20 000 white rhinos, mostly living in Southern Africa. Several rhino subspecies have been declared extinct in the wild in the last ten years. While some populations are currently increasing, commercial and highly organised poaching is a huge threat to all populations worldwide. There has been a sudden and significant upsurge in poaching in the last five years. In South Africa alone, on average more than one rhino is being poached each day. 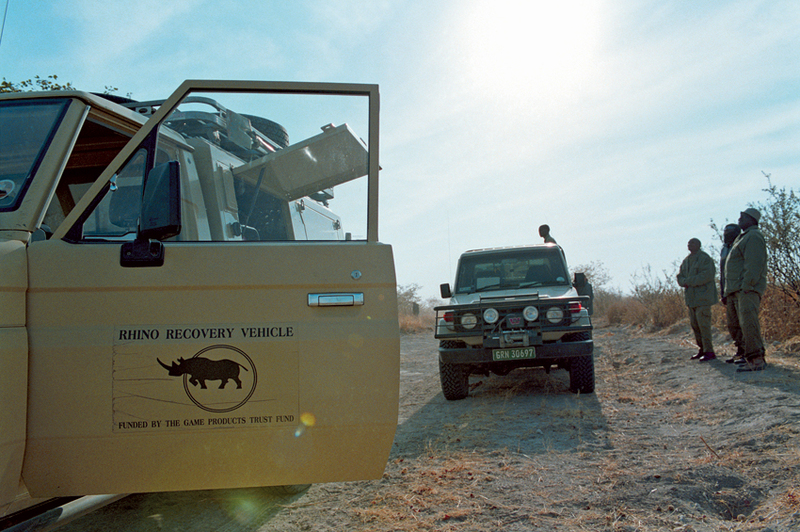 So rhino security means keeping our rhinos safe from poachers. Effective rhino security requires many things – a substantive knowledge of the rhino population, close monitoring of rhino movements, the use of the latest technology and all available information, clear and effective prevention and response measures, and a strong commitment and active collaboration amongst all stakeholders, national and international – which include not only conservation and law enforcement agencies, but also local communities and the general public. What is the situation in Namibia? Namibia has the largest free-roaming population of black rhinos outside national parks anywhere in the world. The country is home to over 90 per cent of the south-western black rhino subspecies, and with South Africa forms the last real stronghold of black rhinos on the continent. The Namibian population is healthy and increasing, having been brought back from the brink of local extinction in the 1960s through concerted conservation efforts. Strategic translocations of black rhinos have been carried out since the mid-1990s by the Ministry of Environment and Tourism (MET) under its national Rhino Custodianship Scheme. Animals have been moved from areas of high population density in national parks, and later from communal areas and private reserves, to re-establish former rhino ranges. Black rhinos now occur in numerous sub-populations from the Orange River all the way northwards to the Kunene. While the translocations have spread the risks of poaching across the country, this does not mean that the animals are easy to find anywhere – the country is vast and dry, and the rhinos are sparsely spread. Namibia also has an increasing population of white rhinos, which had become locally extinct at the beginning of the 1900s, but were reintroduced from South Africa, both into national parks and onto private farms and game reserves, where they have done very well. South Africa is still home to over 90 per cent of the total population today. One of the most important criteria for protecting rhinos is to know accurately how many rhinos there actually are, and where they are. To this end, the MET continues to undertake extremely detailed population censuses, including aerial block counts of the large rhino range in the Etosha National Park, done by helicopter to ensure maximum accuracy. 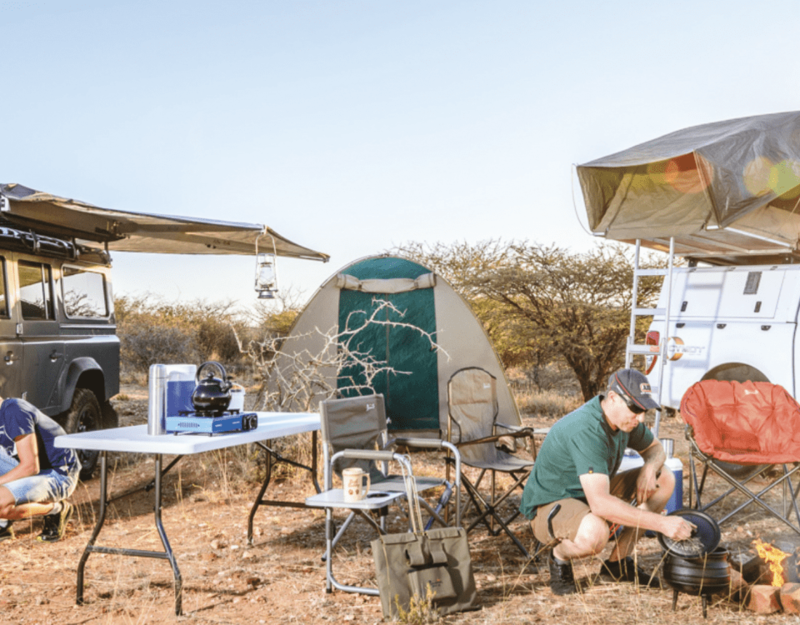 In the north-west, the Save the Rhino Trust (SRT) has done continuous rhino monitoring for several decades and has built up one of the best rhino databases in the world. 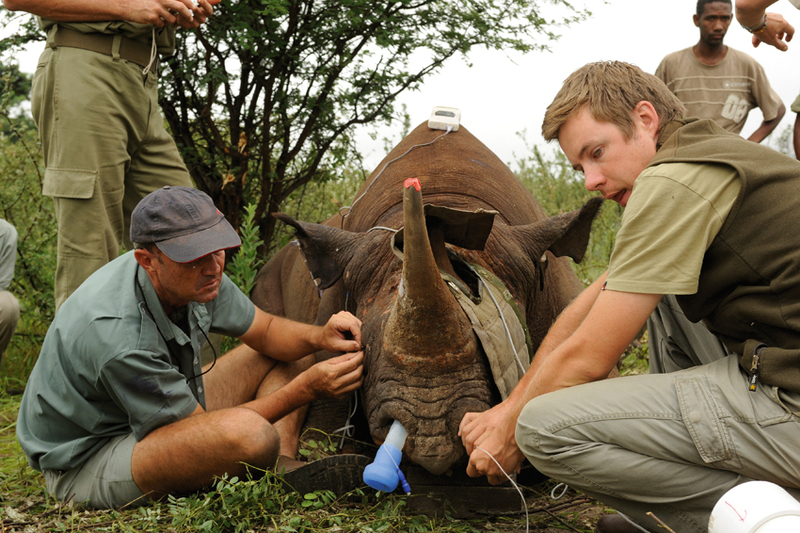 To know in detail where the rhinos move, a high percentage of the animals have been fitted with transmitters that allow accurate tracking of movements. In many areas, remote camera traps are employed to assist monitoring efforts, while physical tracking and observation by field staff are integral to rhino monitoring by the SRT and communal conservancies in the north-west. More recently, the MET has begun to use small, remote-controlled devices, known as drones, as a further tool for monitoring critical parts of the rhino range. The SPAN Project, WWF in Namibia, Save the Rhino International (SRI) in the United Kingdom, the Rhinoceros and Tiger Conservation Fund of the United States Fish and Wildlife Service (USFWS-RT), and other organisations, have provided important support to these national rhino monitoring efforts. 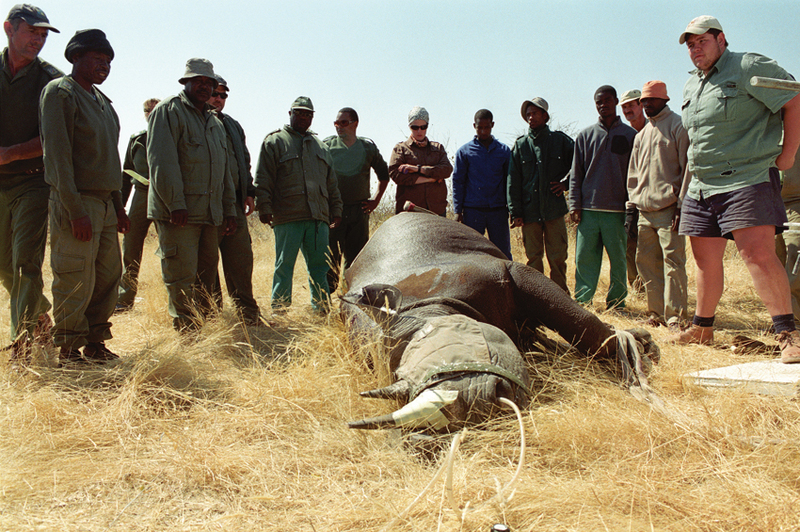 The MET held the first specific Rhino and Elephant Security Workshop in Namibia several years ago to assess risks and shape security approaches. The workshop was attended by numerous regional and international rhino experts, national and international law enforcement officials, and representatives from conservancy and conservation NGOs. Funding support was again provided by the WWF in Namibia and the SPAN Project. A follow-up workshop will be held in November 2012, sponsored by SRI and the USFWS-RT. Since the first workshop, the MET has continually refined rhino monitoring and security efforts. There has been additional training of key staff in tracking and weapons handling, law enforcement and crime scene investigation. Collaboration with the Protected Resources Unit of the Namibian Police, as well as with InterPol, has been strengthened. The MET works closely with local communities and has set up local intelligence networks. These are integrated into a national network for reporting any suspicious activities. Community conservation generally plays an important role in Namibia’s rhino security, both in the communal conservancies where an increasing number of rhinos occur, and with the friendly park neighbours that benefit directly from national parks and have a keen interest in the conservation of valuable species. To enable rapid reporting by civil society at a national level, a dedicated rhino security hotline (55555) was launched in 2011 in partnership with MTC, based on a system of toll-free, confidential mobile-phone text messages. The launch was accompanied by a high-profile media campaign to raise awareness of both the hotline and the urgent need to report any suspicious activities. The black rhino is one of Namibia’s iconic wildlife species, and has become a central feature of Namibian tourism. Rhino tracking is becoming one of Namibia’s defining tourism experiences. Activities are tightly controlled to minimise disturbance of rhinos, while income to local communities promotes rhino conservation. People know that poaching a rhino is in effect stealing from the community. 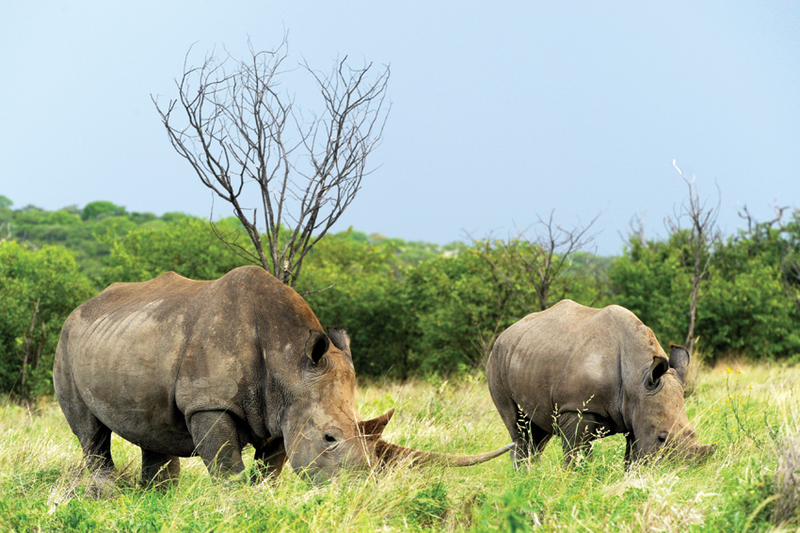 Regular tourism activities also help to monitor and protect the rhinos. However, none of this makes Namibia immune to rhino poaching. International efforts are needed to change the motivations for poaching. In August, the WWF launched a high-profile, worldwide campaign in partnership with TRAFFIC, the wildlife-monitoring network, under the banner ‘kill the trade that kills’. At the 67th annual meeting of the United Nations General Assembly in September 2012, wildlife crime was officially recognised as a threat to the rule of law, alongside threats such as corruption and drug trafficking. With so much local, national and international interest in their welfare, why are rhinos still being poached? And why has the situation become worse and not better? Because rhino horn has become the most valuable renewable natural resource in Africa. It is used mostly as a medicinal ingredient in Asia, and has recently been tagged with the myth of providing a cure for cancer. The largest rhino-horn markets are in China and Vietnam. And as long as there are consumers willing to pay high prices that make it worthwhile to poach rhinos and trade with their horns, there will be people willing to take the risks. In the currently desperate situation, the option of legalising the trade in rhino horn and supplying the market with horns stockpiled from natural mortalities and ‘farmed’ horn from live rhinos (the horns grow back naturally after being cut off) has been debated internationally. The idea is to increase the economic value of live rhinos and generate direct funding for rhino conservation from the horns, while at the same time creating a legal market that shifts the focus away from illegal activities. It is a complex debate with many hidden complications and still has many more opponents than supporters. While rhino monitoring and security are vital in all rhino ranges, the one change that is ultimately likely to stop all rhino poaching is a decision by consumers to stop using rhino-horn products. Targeted programmes need to spread the awareness that rhino horn has no real medicinal value, that modern medicines are much more effective, and that the continued use of rhino-horn derivatives is rapidly driving rhinos everywhere towards extinction. In our modern world, dominated by mass media and information at a click, shouldn’t this be possible? This article originally appeared in the 2013 Conservation and the Environment in Namibia magazine.